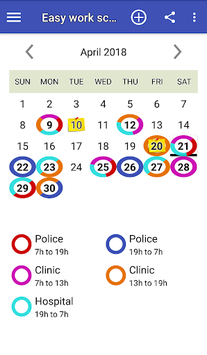 Application developed to facilitate the day-to-day work of professionals working on a scale / shift schedule. Possibility of holding up to three shifts in a single day. 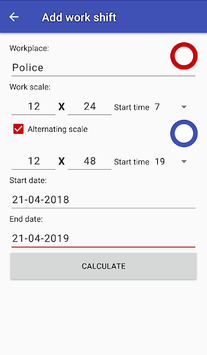 Automatic calculation of days to work for a certain period. Alternate scale for military police officers working on 12x24 / 12x48 scale. It attends the routine of several professionals: policemen, doctors, nurses. It is also possible to change some day that was calculated automatically if you need to perform a shift on duty with another professional. To do this simply remove the shift on the day, and select a day in the calendar to add the previously registered shift. Customization of alarm and notification. Custom Pattern - for any type of complex or simple shift work.